I think it important to mention that St. James is a very small church, with a congregation of mainly retirees. We never have more than a handful of kids. However, as with most, Easter is a time when our churches are full to capacity. Many visitors and newcomers, many with kids, come from far and near to share the blessings of this day. At that time, I was a mother of young ones. So, I seized the opportunity to make sure all of the children knew how important they were in the celebration of Easter. I invited parents and kids alike, to help us “Set HIS Table” for that morning’s late service. It didn’t take any longer that usual and it was great fun to have so many “helpers” buzzing about making sure that our Festival Eucharist was a true Parish family celebration. They learned technical terms like ciborium and cruet. They helped our altar team count the communion wafers, fold purificators and “wash the dishes.” Even now, I am moved at the memory of their little faces as they began to truly understand what the bread and wine really meant. It was touching how the older ones would govern the younger ones, making sure there were no “Sacristy shenanigans.” They were all so eager to help in preparing for that special time in our Sunday service, and the moms enjoyed watching their kids explore and discover something that was otherwise a mystery to them. When we were finished, each child received a small prize from a treasure chest that reflected a celebratory Easter message. 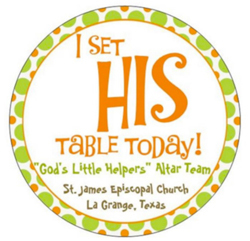 They also were given a little sticker that read “I set HIS table today!” I remember one little guy in particular, Luke. He was four years old and the sticker almost covered his whole chest. He wore that sticker during the service, all through the Easter egg hunt and playground time. His mom reported that he carefully placed the sticker on his pajamas that night and planned to wear it every day, until the next Sunday — when he could set Jesus’ table again! From that moment on, there was a renewed spirit in our altar guild. (Yep, that was truly what we had hoped for.) That wonderful little experiment gained our altar guild two new team members: one was a mom and the other was someone that was excited about what we had done with the kids. Now, we take great care to invite the kids and their families to help with other duties like “the Big Clean,” making Palm Crosses and Advent Wreathes, Rally Day, decorating for Christmas and just about any other opportunity we can think of. All of those kids are now grown and serve as acolytes, readers, choir members and, yes, even help on the altar guild. Every once in a while, one of them will recall that first Easter service and how “cool” it was to be a part of something so BIG. That impression on their hearts shows me, and our entire parish family, that the future of our church is in good hands. So, to answer your question…embrace the talents and freshness that the young (and youngish) may provide. You might be surprised at the way your Altar Guild may grow. Be blessed!